at the SoCon Tournament Thursday. Photo courtesy of Furman. 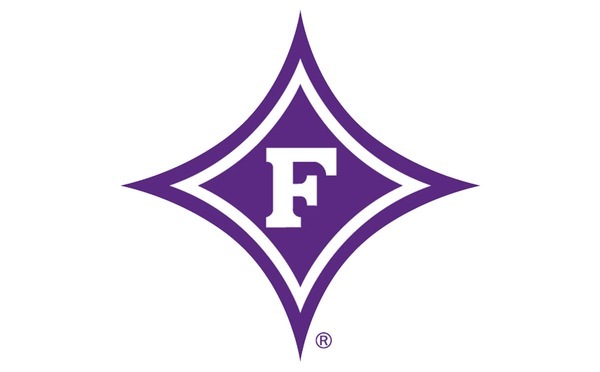 A frustrating 2018 baseball season came to an end in a bizarrely fitting fashion for Furman Thursday afternoon in the Southern Conference Tournament at Fluor Field. The Paladins trailed ETSU 5-2 with two out in the ninth when Bret Huebner and Sims Griffith had consecutive singles that should've brought up Ben Anderson as the potential tying run. But Furman's best player, who was due after a rough tournament, never made it to the plate. After Griffith's ball kicked off of ETSU leftfielder Ben Jackson, Huebner was waved around third and tagged out at home to end it. The baseball team became the latest program whose season ended at the hands of the Buccaneers, joining men's basketball, men's tennis and softball. Furman went 2-5 against ETSU in SoCon tournaments this season, with the women's tennis and women's soccer teams accounting for the wins. For the second game in a row, Furman's offense was held in check. ETSU starter Ryan Simpler (7-6), who entered with a 5.46 ERA and a loss during the Paladins' final series of the regular season, pitched a complete game. Simpler scattered 10 hits, had no walks and four strikeouts, and threw 95 of his 134 pitches for strikes. Furman took an early lead on Landon Kay's RBI-single with two out in the first. The Bucs (28-24) came back in the third with three runs, all scored with two out. Jason Costa's two-out RBI-single in the fifth sliced ETSU's lead to 3-2. The Bucs added some insurance in the eighth on Cade Gilbert's two-run double. 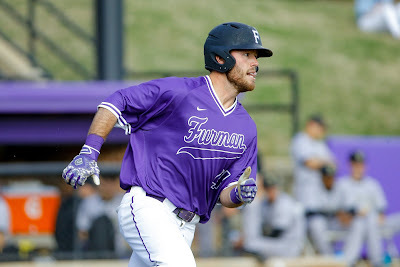 Furman (24-28) finished the tournament with three extra-base hits - doubles by Landon Kay, Logan Taplett and Bret Huebner on Thursday, and no walks. After drawing three three-ball counts on Wednesday, Furman batters had only two Thursday. Anderson, who reached base via a hit, walk or hit by pitch in 47 of 50 regular season games including 32 consecutive to end the regular season, only reached base once in the tournament on an error. In their final college game, Costa, Kay, Huebner and Griffith had two hits apiece to lead the Paladins.